No one is more passionate about Southern cooking than James Villas, who has written eloquently about barbecue, Brunswick stew, grits, fried okra, and other Southern specialties throughout his career as a food writer and an editor at Town & Country magazine. Now, Villas has at last written the cookbook he was always meant to write: the definitive compendium of classic and modern Southern recipes. The Glory of Southern Cooking draws on Villas's fond food memories from his North Carolina boyhood and his lifelong quest for the tastiest Southern fare. 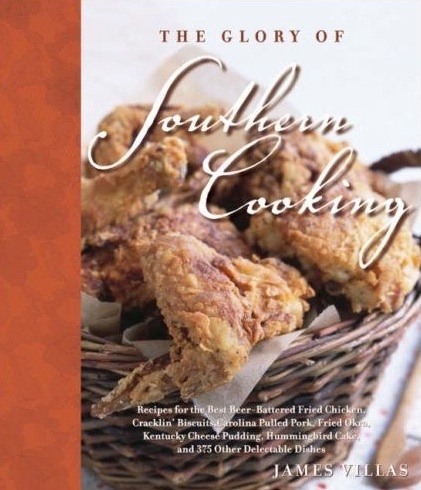 In it, you'll find Villas's authentic recipes for familiar Southern favorites, such as fried chicken, pork barbecue, collard greens, cornbread, and cobblers. But you'll also discover thoroughly delicious regional specialties, many of which are largely unknown outside the locale where they originated: South Carolina Frogmore Stew, Florida Conch Fritters, Mississippi Fried Dill Pickles, and Tennessee Monkey Bread, to name a few. To top it all off, Villas also includes exciting new dishes from some of the South's most esteemed and innovative chefs, including Louis Osteen, Frank Stitt, Ben and Karen Barker, Paul Prudhomme, Paula Dean, Emeril Lagasse, and the late Edna Lewis.